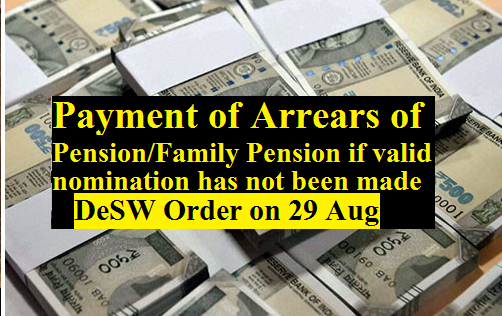 New Delhi, 30 August 2017: Ministry of Defence, Department of Ex-servicemen Welfare has issued order on 29th August 2017 regarding Payment of arrears of pension in cases where valid nomination has not been made under the payment of arrears of pension (Nomination) Rules, 1983 to The Chief of the Army Staff, The Chief of the Naval Staff, The Chief of the Air Staff. Attention is invited to provisions for payment of Arrears of Pension under Regulation 90 of Pension Regulation Part-II (2008), which provide that after the death of the Armed Force Pensioner, all money payable to the pensioner on account of pension due to the estate of a deceased pensioner may be paid to the nominee of the deceased Armed Forces Pensioner. In the absence of any nomination made by the Armed Forces Pensioner, the arrears of his/her pension are paid as per the "Will" if such a "Will" has been made by the deceased Armed Force Pensioner. In case neither nomination nor 'Will" has been made by the deceased Armed Forces Pensioner, the arrears of his/her pension are paid under the orders of the Pension Disbursing Authority to the heir without production of usual legal authority, if the gross amount of arrears of pension claim does not exceed Rs. 10,000=00, provided he is otherwise satisfied about the right of the claimant. If the gross amount of arrears of pension claim exceeds Rs. 10,000=00, the arrears of his/her pension are paid under the orders of Principal Controller of Defence Accounts (Pension) on execution of an Indemnity Bond in Form IAFA-642 duly stamped for the gross amount due for payment with such sureties as may be deemed necessary and accepted on behalf of the “President by an officer duly authorized under Article 299(i) of the Constitution. In case of any doubt, payment is made only to the person producing the legal authority. (i) Under the orders of the Pension Disbursing Authority to the heir without production of legal authority, if the gross amount of arrears of pension claim does not exceed Rs. 25,000/-, provided he is otherwise satisfied about the right of the claimant. (ii) If the gross amount of arrears of pension claims exceeds Rs 25,000/- but does not exceed Rs 2,50,000/-, under the orders of Principal Controller of Defence Accounts (Pension) on execution of an Indemnity Bond in Form IAFA-642 duly stamped for the gross amount due for payment with such sureties as may be deemed necessary and accepted on behalf of the President by an officer duly authorized under article 299(i) of the Constitution. (iii) In case of any doubt and also in cases where the amount of arrear exceeds Rs 2,50,000/-, payment shall be made only to the person producing the legal authority. Normally there should be two sureties both of known financial ability. However, in case the amount of claim is less than Rs 75,000/- the authority accepting the Indemnity Bond for and on behalf of President of India should decide on the merits of each case whether to accept only one surety instead of two. The obligor as well as the sureties executing the Indemnity Bond should have attained majority so that the bond has legal effect or force. The Bond is required to be accepted on behalf of the President by an Officer duly authorized under Article 299(i) of Constitution. This Ministry letter No. 1(16)/2009-D(Pen/Policy) dated 15.03.2010 stipulates that in the event of death of a family pensioner, the right to receive any arrears of family pension would automatically pass on to the eligible member of the family next in line. The requirement of succession certificate for payment of any arrears occurs only where there is no member in family who is eligible to receive family pension after the death of the family pensioner. Therefore, it has been decided that the provision of this letter will also apply to the payment of arrears of family pension where no member of family is eligible to receive family pension. These orders will not be applicable In the cases where valid nomination exist under GOI, MOD letter No.4(2)84/868/B/D(Pens/Services) dated 09.05.1984. This issue with the concurrence of Ministry of Defence (Finance/Pension) vide their ID No. 10(04)/2017/Fin/Pen dated 03 August 2017. After the death of the Armed Force Pensioner, all money payable to the pensioner on account of pension due to the estate of a deceased pensioner may be paid to the nominee of the deceased Armed Forces Pensioner. In the absence of any nomination made by the Armed Forces Pensioner, the arrears of his/her pension are paid as per the "Will" if such a "Will" has been made by the deceased Armed Force Pensioner.